Or 6 payments of $46.50 What's this? Mares Razor Pro is a new fin with an interchangeable blade. The foot pocket is incredibly comfortable due to the design developed in collaboration with a leading Italian foot (podology) clinic. Its shapes and the extra thickness on the instep and the tensioners under the arch have been meticulously researched to convey the maximum amount of energy produced to the blade, yet still provide complete comfort. The variable-thickness blade bends during the various phases of fining action, achieving an ideal flexion curve; this is due in part to the use of the best techno-polymers, the true core of agility and elasticity. The special design of the channels on the blade and the lateral stringers on the foot pocket make it possible to channel and increase the flow of water toward the pronounced V" at the tip, increasing thrust and preventing the fin from slipping laterally. Its light weight and power give the Razor Pro the best yield among all the techno-polymer fins currently available on the market. Fin pocket comes in 5 sizes and comes with a 24 month limited warranty. 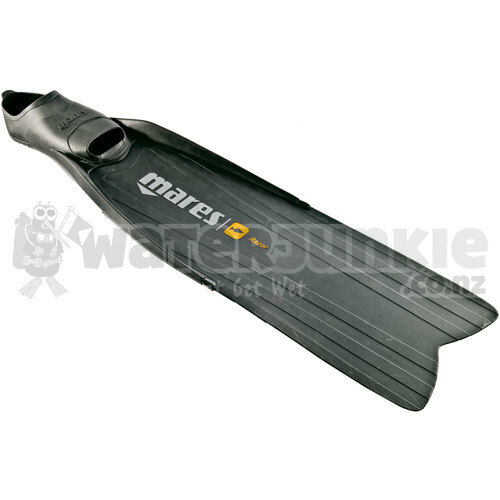 The Mares Razor Pro Spear Fishing Full Foot Fin is commonly used for Snorkeling and more. The Mares Razor Pro Spear Fishing Full Foot Fin is popular because customers like the following qualities of the Mares Razor Pro Spear Fishing Full Foot Fin: Comfortable, Efficient, Lightweight.